Brand new and high quality Replacement 19V 4.74A 90Wh AC adapter charger for HP Chromebook 14, Pavilion 10, Pavilion X2,Stream 11, Stream 13, Stream 14 laptops. Note : 1. Please ensure your old AC Adapter's Output and Connector are same to our product. 2. Power cord NOT included, you can use your original power cord. If you need the power cord, please remark it when place an order. Power cord NOT included, you can use your original power cord. If you need the power cord, please remark it when place an order. 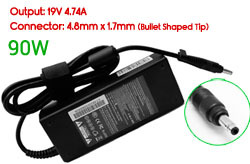 Brand new,100% OEM compatible with the original HP 19V 4.74A 90W AC Adapter. Provided with best quality products at the best price as well as the best after sales service, you will be fully satisfied; if you have any questions or feedbacks about our replacement HP 19V 4.74A 90W AC Adapter or our services, please contact us directly; our customer service will reply you within 24 hours.